I am still not feeling 100 percent. Yet, i am still spending about 4 hours a day in the kitchen preparing food for 3 people for 3 meals plus a couple snacks per person. I woke up a bit sleepy around 7am and wanted to go back to sleep; however, my sister was up and wanted us to take our morning measurements. I had a little trouble focusing today. I think this is still to do with being sick. I was able to get quite a bit of work done today, but it was mostly busy work. I did not feel foggy. No stomach issues, no headaches. I have had a little bit of an itchy skin mostly on my face, but my face is not any worse for wear. Also my head is a bit itchy. Its more annoying then troublesome. I did not get any cravings today. Tho eating, just felt like alot of work and not much fun. It is so much chewing. I was not very thirsty today and only drank 2 or 3 glasses of water, way down from my normal 10- 16 (i play alot of sports, tho i being sick i have not played any in a few days). This evenings dinner seemed to stay in my stomach. Not any longer then usual, but i just seemed more aware of the fact my stomach was full. It was not uncomfortable, it was there, and i am not typilly aware of the state of my stomach unless i ate too much or am hungry. I again did not feel like eating breakfast. I made smoothies for mom and linsday for breakfast. This is swiss chard, pear, mint. Mom said it was good, that the only real things she could taste is the pear. Around 1030, i had a pear then plum. 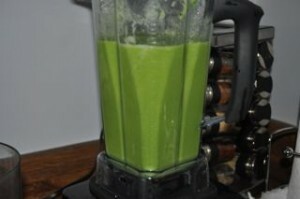 An hour later, i was ready for some food, and decided to make something up, i started calling it cucumber goodness It was the best thing i have made so far. 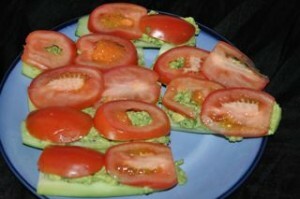 Cucumber on the bottom, topped with guacamole, then tomato slices on top. Yum. I had a couple raw nuts after, and it was a nice end to the meal. For my moms, I put some of that sunflower pate she liked from yesterday so much between the cucumber and guacamole. 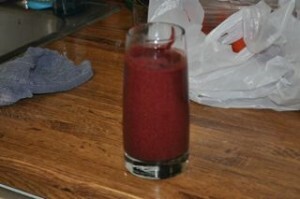 Blueberry, raspberry, blackberry, orange, coconut, spinach. I then started to make dinner. I made zucchini pasta with pesto sauce. It was great the first bite, and i love pesto. The second bite, was good. Then i was bored. 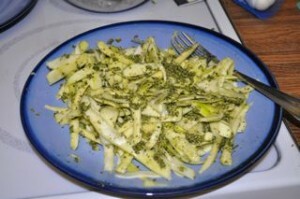 Usually when i have pasta with pesto, i cant wait to eat it. Every bite is great and as i eat, it gets better. It was good, but it was not real pasta. About 25 percent of the way thru my plate, i was so done, but i was hungry. so i finished it. I guess the best way to describe it is: it was not bad, but it was not good. The pesto was amazing, i think i will use that for something else in the future. It has been 2 interesting days. I look forward to see what the rest of the month brings. I however, really look to eating beans and ice again, veggie soup, and vegan ice cream. 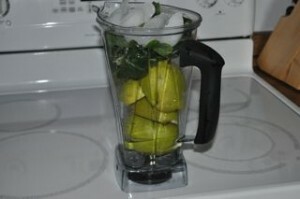 However, i am still really excited to see what other things i come up with to eat and else i will learn doing this. Lindsay fell asleep at 830, so if she gets me her day two, i will put it up here later. I am so ready for bed. 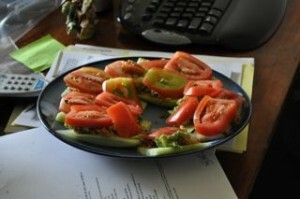 This entry was posted on Tuesday, March 3rd, 2009 at 4:36 am	and is filed under Raw Food. You can follow any responses to this entry through the RSS 2.0 feed. You can leave a response, or trackback from your own site. What kind of measurement do you take? Just weight scale and electronic bmi index? Well, lots of measurements actually. Weight, BMI, inches for waist, arms, hips, etc. Then there is the subjective ones like how did you feel when you woke up, how is your skin today, etc. We are both tracking different things, and at the end, i will put up some graphics.